Of all cases of idiopathic steroid-sensitive nephrotic syndrome (NS) in children, 40%–75% cases need long-term continuous steroids and/or other immunosuppressants to maintain remission, the effects of which on growth and renal function remain an issue of concern. The study aimed at exploring the safety and efficacy of mycophenolate mofetil (MMF) as a remission-maintaining agent in children with a diagnosis of frequent relapsing or steroid-dependent NS (FRNS/SDNS) requiring continuous medication for at least 1 year. Thirty-two children thus included received MMF (1000–1200 mg/m2/day) for 7 months along with tapering doses of oral prednisolone if it was being given from before with an attempt at tapering at 0.25 mg/kg/month ultimately stopping it altogether. Individuals were followed up for at least 5 more months after stopping MMF. Out of 32 children, 26 had SDNS and 6 had FRNS with male:female ratio being 2.2:1. The mean standard deviation (± SD) age of onset of disease was 2.72 ± 1.3 years and that entry to the study was 7.17 ± 2.2 years. Significant fall in number of relapses was observed following the introduction of MMF (110 in pre-MMF12 month period vs. 52 in post-MMF 12 months [p = 0.002]). The mean relapse rate/year/patient also decreased from 3.43 ± 1.26 to 1.62 ± 1.14 after entry in the study. Significant reduction of the cumulative dose of steroid regarding mean ± SD of mg/kg/year was also found following the introduction of MMF (190.9 ± 47.81 vs. 119.09 ± 60.09 [p = 0.001]). MMF is an efficacious agent in maintaining remission and reducing steroid requirement in children with FRNS and SDNS. Nephrotic syndrome (NS) is a common condition in children, 95% of which are idiopathic or primary. Eighty percent of these children respond to oral steroids and are thus called steroid-sensitive NS (SSNS). Of all the steroid-sensitive episodes, 25%–40% are infrequent relapsers who remain steroid free for prolonged duration of time. However, the rest are either frequent relapsers NS (FRNS) or steroid-dependent NS (SDNS) who need long-term steroids putting them at risk of various side effects such as cushingoid features, hypertension, growth failure, and even emotional problems., In such cases, the aim of the therapy remains to maintain remission with some alternative drugs as steroid-sparing agents such as levamisole and cyclophosphamide cyclosporine which again have the possibility of undesirable effects. Mycophenolate mofetil (MMF), which initially was tried as an immunomodulator in transplant medicine, is gradually evolving as a new therapeutic agent for childhood NS, especially as a steroid-sparing agent for prevention of relapses. 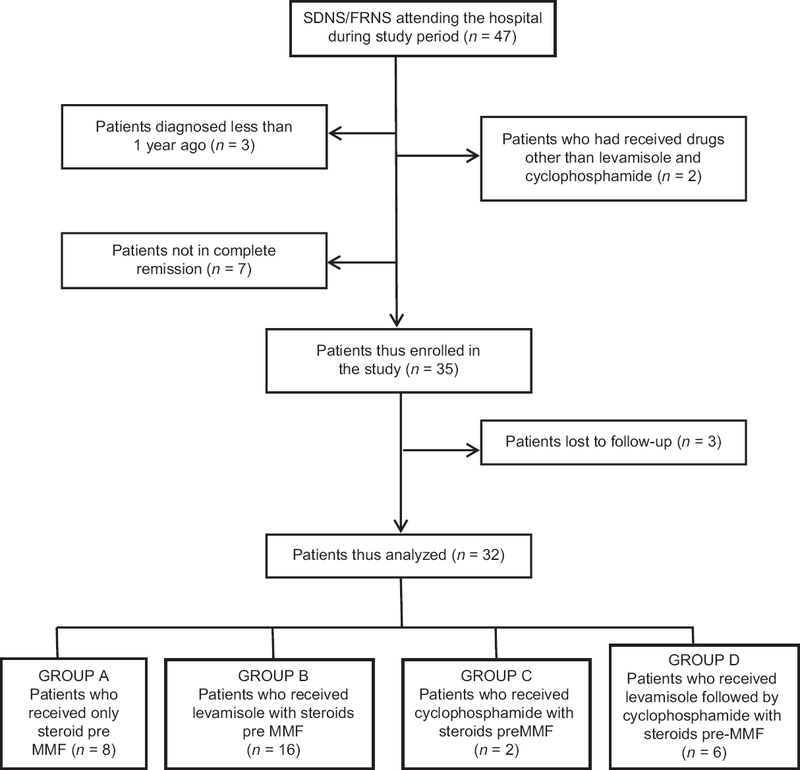 This study was done with an objective to determine the safety and efficacy of MMF in maintaining remission and reducing the number of relapses in childhood idiopathic NS both during and after the period of therapy. All children attending a tertiary care teaching hospital in Kolkata between 2 and 12 years of age given a diagnosis of idiopathic SDNS/FRNS and were on continuous medication for at least 12 months to prevent relapses were considered for inclusion in the study. Institutional Ethics Committee clearance was obtained. Written informed consent was taken from the guardians of the patients included in the study. Assent was also taken from children who were more than 7 years old. Frequent relapse was defined as four or more relapses in any 1-year duration. Steroid dependence was defined as 2 or more consecutive relapses while tapering or within 14 days of stopping the steroids. However, children not in complete remission on presentation, with estimated glomerular filtration rate <50 ML/MIN/1.73 m2, prior administration of MMF for more than 15 days, absolute neutrophil count (ANC) <2000/mm3, and those with comorbidities such as asthma and symptomatic tuberculosis were excluded from the study. Cases where detailed previous records were not available or with irregular history of compliance were also excluded from the study. The demographic, clinical, treatment and investigational details of the included patients were documented in a predesigned pro forma. It was a prospective, interventional study taking each patients' retrospective data for the last 12 months into account, each patient serving as his/her own control in the preintervention period. MMF was started at the dose of 1000–1200 mg/m2/day (maximum of 1 g twice daily) in two divided doses till 24 weeks. Then, it was reduced by 50% every 2 weeks with the aim to stop it at the end of 28 weeks. Oral prednisolone was continued if it was being given from before with an attempt at tapering at 0.25 mg/kg/month ultimately stopping it altogether. Any relapse during the study period was managed according to the recommendation of Indian Pediatric Nephrology Study Group. The patients were closely monitored both as regards their blood counts, renal functions, and other adverse effects. Children were followed up routinely every 2 months (more frequently if required) till at least 5 months of stopping MMF. The total duration of follow up was thus 12 months, 7 months on MMF, and next 5 months after withdrawal of MMF. The guardians were trained to monitor urinary protein at home and to maintain a written record. They were asked to report immediately if there were signs of relapse or urine protein became ≥+++ or there were any other significant health problem. The dosage of MMF was reduced to 800 mg/m2 when MMF related toxicity was suspected. The dosage was further reduced, or it was completely stopped if the problem persisted. The outcome variables were measured regarding relapse rates and cumulative dose of steroids required to maintain remission before and after intervention. More than two relapses during the study period were considered as treatment failure, and alternative drugs were considered for those cases. The data were entered into MS-Excel and then analyzed with Statistica version 8 (Tulsa, Oklahoma: StatSoft Inc., 2007) and MedCalc version 11.6 (Mariakerke, Belgium: MedCalc Software, 2011) statistical software. Key proportions have been expressed with 95% confidence interval values. Paired t-test was used for comparison of numerical variables with the patients acting as their own control. Value of p < 0.05 was taken to be statistically significant. Out of a total of 47 children with SDNS/FRNS attending our hospital during the study, 35 were included in the study [Figure 1]. The records of 32 children were analyzed as 3 were lost to follow-up. Of these, 26 were SDNS and 6 FRNS [Table 1]. The cohort consisted of 22 (69%) boys and 10 (31%) girls. The mean standard deviation (±SD) age of onset of NS was 2.72 ± 1.3 years (range 1.5–4.5 years) that of diagnosis of FRNS/SDNS was 4.9 ± 1.6 years (range 3.0–7.0 years) and the mean (±SD) age of entry to the study was 7.17 ± 2.2 years (range 4.8–9.3 years). Children were receiving continuous immunosuppressant for 1.8 ± 0.6 years (mean ± SD) before entering the study phase. While 8 had been on only low-dose steroids, 16 had received levamisole with steroids, 2 children had got a course of oral cyclophosphamide, and 6 had received both levamisole and cyclophosphamide in a sequential manner with steroids. The mean dosage of MMF used was 1131.56 ± 49.6 mmg/m2/day (range 1041–1198 mg/m2/day). Renal biopsy done in eight patients revealed minimal change disease in 7 and IgM nephropathy in 1. Significant fall in a number of relapses was observed following the introduction of MMF (110 in pre-MMF12-month period versus. 52 in post-MMF 12 months [p = 0.002]). [Figure 2] shows the comparison of relapses/year in individual patients before and after entering the study. By applying WILCOXON nonparametric test, the mean relapse rate/year/patient before entry was 3.43 ± 1.26 (range 1–5, Interquartile ratio 3–4) whereas it was 1.62 ± 1.14 (range 1–4, interquartile ratio 1–2) after entry in the study. Significant reduction of cumulative dose [Table 1] of steroid ranging mean ± SD of mg/kg/year was also found following introduction of MMF (190.9 ± 47.81 vs. 119.09 ± 60.09 [p = 0.001]) [Table 1]. [Figure 3] shows a comparison of cumulative dose of steroid in pre- and post-MMF12 month period. Two patients complained of pain abdomen within 2 weeks of starting MMF. However, the symptoms gradually subsided on reducing the dose to 800 mg/m2/day. None of the patients showed any significant alteration of blood counts and none required withdrawal or stoppage of MMF because of side effects. Children were classified into four groups based on the medications received in the year before starting MMF [Table 2]. It was seen that MMF fared significantly better in all the groups both in reducing the number of relapses and also the cumulative dose of steroids. Test of significance could not be done in Group C due to few subjects (n = 2). These two children in Group C had one episode of relapse each both in pre-intervention, and postintervention period, however, there were no relapses while on MMF. Both the relapses occurred after withdrawal of MMF during the 5-month drug-free follow-up period. These two patients also required much less cumulative dose of steroid after administration of MMF compared to when they got cyclophosphamide. MMF is the 2-morpholinoethyl ester of mycophenolic acid (MPA). It is a prodrug that is rapidly hydrolyzed to the active drug, mycophenolate acid (MPA), a selective, noncompetetive and reversible inhibitor of inosine monophosphate dehydrogenase, an important enzyme in the de novo pathway of guanine synthesis. Besides inhibiting both B and T lymphocytes, MPA is shown to inhibit vascular smooth muscle cell and mesangial cell proliferation, to be a selective inhibitor of inducible nitric oxide synthase and to induce apoptosis in activated T cells. One or any combination of these functions may be accountable for amelioration of inflammation and/or structural remodeling characteristic of the glomerular disease. The principal toxicities of MMF are gastrointestinal and hematologic which include leukopenia, diarrhea, and vomiting. It was initially used as an immunosuppressant for prevention of organ transplant rejection.,,,, However, afterward the role of MMF as a steroid-sparing alternative in idiopathic NS has also been explored. It has generally been used when the frequency of relapses remain unacceptable despite prolonged steroids, levamisole, cyclophosphamide, and even cyclosporine. The findings of few previous studies using MMF in NS are summarized in [Table 3]. In most of the studies, MMF has been shown to result in statistically significant reduction in frequency of relapses as well as the cumulative dose of steroid required, irrespective of the previous alternative drugs used.,,,,,, Our results were also comparable. Some studies have also been published from India and other Asian countries starting from the year 2003, which also show favorable response to MMF with minimal side effects.,, It should, however, be noted that there is considerable non-uniformity in both MMF dosage and duration and other drugs used both pre MMF and with MMF. The dosage of MMF has been calculated both regarding body weight and body surface area, and it has varied from 600 mg/m2/day to 1200 mg/m2/day and from 25 mg/kg to 40 mg/kg. In addition, there seems to be wide variation in duration of therapy, from 3 months to 7 years. The previous studies have not shown any significant variation of outcome regarding efficacy and side effects with the dosage of MMF given per day. However, the studies involving MMF for longer duration give an indication that MMF is more efficacious in maintaining remission if the duration of therapy is increased from months to several years. Afzal et al. concluded that giving MMF for more than 12 months is more efficacious than 6 months. Treatment continuation beyond 12 months resulted in sustained steroid sparing and reduced need for alternative treatments while maintaining low relapse rates. However, the implications of increasing the duration of therapy on possible long-term complications remain to explored by more robust long-term follow-up studies. Our study included MMF usage for 6 months with benefits in maintaining remission. Search for a systematic review to find out more robust evidence yielded a Cochrane study, which included 32 published studies involving 1443 children regarding the use of nonsteroidal immunosuppressants in SSNS. This review showed an overall beneficial effect of MMF. None one of the previous studies including ours have tried head-on comparison of the efficacy of MMF with steroids, levamisole, and cyclophosphamide as a remission maintaining agent. In our study, MMF could achieve a statistically significant reduction in both number of relapses and also cumulative dose of steroid (p < 0.05). If this favorable profile of MMF is reflected in larger studies also, then MMF could be considered much earlier in the sequence of immunosuppressants for prevention of relapses in childhood NS. MMF associated infectious complications and leukopenia from bone marrow suppression appears to be much less than levamisole and cyclophosphamide, which may be a significant advantage of MMF over these drugs. MMF seems to have a satisfactory and acceptable adverse effect profile, at least in the short term, both in previous studies as well as in the present series. None of the patients in our series required the withdrawal of MMF due to unacceptable side effects. Commonly reported side effects have been gastrointestinal or hematological or infectious, but rarely serious enough to need stoppage or withdrawal of MMF. Hogg et al., in a series of 33 patients, reported that only one patient required the withdrawal of MMF due to fall in ANC to <300/mm3, four others had transient mild reduction in ANC not requiring stoppage of MMF. In other studies, the side effects have been relatively minor which subsided after reducing the dosage.,, Of course, more studies of longer duration are required to know the incidence of long-term effects, if any. Our study throws light on the efficacy of MMF as a remission maintaining agent from Eastern India. However, it also has its share of limitations regarding limited sample size and shorter duration of follow-up. Owing to logistic issues and the drug being costly, we had to limit the duration of administration to reduce follow-up attrition of patients in our resource-limited settings. Longer duration of administration of MMF and longer duration of follow-up after withdrawal would have given more robust results. In addition, the previous year data were collected retrospectively from patient records. Retrospective data of each patient served as his own control and were used as the comparison arm to minimize variability of clinicoepidemiological profile of MMF and non-MMF arms, the drug administered being the only variable. MMF seems to have a favorable efficacy and side effect profile as a steroid-sparing agent in maintaining remission in childhood NS. While there seems to be a general agreement on the efficacy of MMF in preventing the relapses in NS, jury is still out regarding the optimal dosage and duration of MMF. Bagga A, Srivastava RN, editors. Nephrotic syndrome. In: Pediatric Nephrology. 5th ed. New Delhi: Jaypee; 2011. p. 195-234. Indian Pediatric Nephrology Group, Indian Academy of Pediatrics, Bagga A, Ali U, Banerjee S, Kanitkar M, Phadke KD, et al. Management of steroid sensitive nephrotic syndrome: Revised guidelines. Indian Pediatr 2008;45:203-14. Barletta GM, Smoyer WE, Bunchman TE, Flynn JT, Kershaw DB. Use of mycophenolate mofetil in steroid-dependent and -resistant nephrotic syndrome. Pediatr Nephrol 2003;18:833-7. Bagga A, Hari P, Moudgil A, Jordan SC. Mycophenolate mofetil and prednisolone therapy in children with steroid-dependent nephrotic syndrome. Am J Kidney Dis 2003;42:1114-20. Novak I, Frank R, Vento S, Vergara M, Gauthier B, Trachtman H, et al. Efficacy of mycophenolate mofetil in pediatric patients with steroid-dependent nephrotic syndrome. Pediatr Nephrol 2005;20:1265-8. Ulinski T, Dubourg L, Saïd MH, Parchoux B, Ranchin B, Cochat P, et al. Switch from cyclosporine A to mycophenolate mofetil in nephrotic children. Pediatr Nephrol 2005;20:482-5. Hogg RJ, Fitzgibbons L, Bruick J, Bunke M, Ault B, Baqi N, et al. Mycophenolate mofetil in children with frequently relapsing nephrotic syndrome: A report from the Southwest Pediatric Nephrology Study Group. Clin J Am Soc Nephrol 2006;1:1173-8. Afzal K, Bagga A, Menon S, Hari P, Jordan SC. Treatment with mycophenolate mofetil and prednisolone for steroid-dependent nephrotic syndrome. Pediatr Nephrol 2007;22:2059-65. Gellermann J, Weber L, Pape L, Tönshoff B, Hoyer P, Querfeld U, et al. Mycophenolate mofetil versus cyclosporin A in children with frequently relapsing nephrotic syndrome. J Am Soc Nephrol 2013;24:1689-97. Allison AC, Eugui EM. Mycophenolate mofetil and its mechanisms of action. Immunopharmacology 2000;47:85-118. Bansal SB, Saxena V, Pokhariyal S, Gupta P, Kher V, Ahlawat R, et al. Comparison of azathioprine with mycophenolate mofetil in a living donor kidney transplant programme. Indian J Nephrol 2011;21:258-63. Mele TS, Halloran PF. The use of mycophenolate mofetil in transplant recipients. Immunopharmacology 2000;47:215-45. Thervet E, Anglicheau D, Legendre C. Pharmacology of mycophenolate mofetil: Recent data and clinical consequences. Nephrologie 2001;22:331-7. Sollinger HW. Mycophenolate mofetil for the prevention of acute rejection in primary cadaveric renal allograft recipients. U.S. Renal transplant mycophenolate mofetil study group. Transplantation 1995;60:225-32. A blinded, randomized clinical trial of mycophenolate mofetil for the prevention of acute rejection in cadaveric renal transplantation. The Tricontinental Mycophenolate Mofetil Renal Transplantation Study Group. Transplantation 1996;61:1029-37. Baudouin V, Alberti C, Lapeyraque AL, Bensman A, André JL, Broux F, et al. Mycophenolate mofetil for steroid-dependent nephrotic syndrome: A phase II bayesian trial. Pediatr Nephrol 2012;27:389-96. Lim TJ, Kim SH, Kim SY. Efficacy and safety of mycophenolate mofetil in children with steroid dependent nephrotic syndrome. Child Kidney Dis 2015;19:105-11. Pravitsitthikul N, Willis NS, Hodson EM, Craig JC. Non-corticosteroid immunosuppressive medications for steroid-sensitive nephrotic syndrome in children. Cochrane Database Syst Rev 2013;10:CD002290.